Having just returned from a research trip to Zuni Pueblo, I am thrilled to offer a thematic presentation celebrating Zuni jewelry. In my opinion, Zuni jewelry is one of the most complex, technically perfect, creative and artistically balanced types of American Indian jewelry ever made, and it is still quite under-appreciated. It is essential that serious collectors of American Indian jewelry become increasingly familiar with Zuni work as it is so well-executed and still quite undervalued. In fact, I’m currently researching for two separate books with Zuni jewelry themes because I believe that the outstanding jewelry is worthy of so much more recognition. Zuni Pueblo has a population around 10,000 and over 80% of those people work as artists. 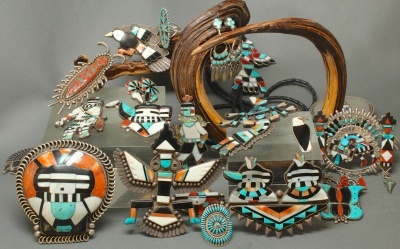 Zuni artists are best known for their fetish carving and their inlay jewelry, which they’ve been doing for more than 1000 years. In pre-Columbian times, they cut and polished stones and shells and formed patterns by attaching those pieces to wood, bone, or shell backs using the pitch from pinon trees. After the arrival of the Spanish and their introduction of silver, Zuni eventually used silver as the background for their mosaic work. 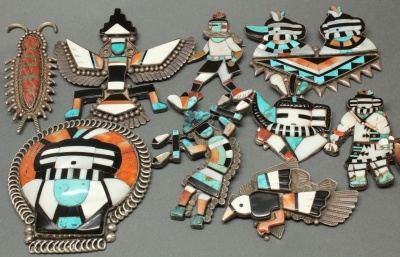 By the early 20th century, Zuni artists began to create the intricate inlay jewelry that we recognize today as mosaic inlay and channel inlay. Jewelry by the early Zuni masters is superb and sometimes still unmatched today. Three early Zuni artists - Leo Poblano (1905-1959), Teddy Weahkee, and Lambert Homer, Sr. are recognized as being the greatest mosaic jewelry artists, but there are other traditional greats as well like Frank Vacit, Juan de Dios, Dan Simplicio, John Gordon Leak (or Leakity). It is important to note that these people were working entirely by hand, doing their lapidary work with basic tools like pump drills and hand grinders. Most of the greats did not have electricity until the 1950’s or later. Think of that for a moment, and then this walking katsina pin becomes even more of a remarkable feat. While writing of master Zuni artists, I want to take this time to discuss attribution. As these early masters did not sign their work, it is very difficult to attribute pieces to specific artists. Many times, all we can do is make our most educated guess by comparing certain characteristics of specific pieces with those of other pieces and looking for similarities. For example, we know that the celebrated Zuni artist Leo Poblano was an expert lapidarist able to achieve three-dimensional inlay techniques. He learned these from his wife, Daisy Hooee Nampeyo, who studied three-dimensional sculptural relief in 1929 at L’Ecole des Beau Arts in Paris. With this background knowledge about Leo Poblano and Daisy Hooee Nampeyo, we can be fairly certain that this Inlay pin of one horned Katsina was made by Leo Poblano, but we do not know with absolute certaintity. If you put this piece in front of different dealers, you may well receive differing opinions. Even when I go to Zuni with a particular piece in hand, I often receive different attributions from the Zuni people. C.G. Wallace himself, the most famous Zuni trader, who worked tirelessly to promote their jewelry, made some wrong attributions in the well-known auction catalog of his collection. Therefore, in this Zuni celebration, I am giving an opinion on who might have made many of these excellent Zuni pieces, but in most cases, I cannot specifically attribute. The most important point is that these master Zuni lapidary artists created pieces that are technically and artistically superior, some like this Dual Katsina Inlay pin are on a level entirely their own, the likes of which we will never see again. Other pieces, like this outstanding Zuni dancer pin may have been made as a joint effort between family members rather than a single individual. I am proud to be able to present to you some of these Zuni masterpieces that are truly museum worthy. The skill it takes to produce something like this large Knifewing pin is just astounding. The amount of work is immense. Every single little stone has to be cut out by hand and placed in an original colorful mosaic pattern that fits together seamlessly. In my opinion, Zuni jewelry has not yet received its just due, but it will certainly arrive in time. If you look at any other kind of Southwestern American Indian jewelry, it has already seen a great deal of appreciation. Hopi pieces by Charles Loloma, one of my specialties, can command prices at upwards of $50,000. In contrast, my most expensive Zuni piece is this unparalleled Zuni Shell Pin with Inlay Kachina for $7800. $7800 is a bargain for a piece of such quality! Yes, for now in Zuni jewelry, there are still bargins to be had. This Horace Iule Knifewing God Pendant is just wonderful and only $275. Considering Horace Iule was the originator of the Knifewing figure in Zuni inlay, a bargain indeed. We also have an inlay pendant by Leonard Martza for under $150. Yes, Leonard Martza of C.G. Wallace Collection fame. Yes, for under $150! While my collection is quite heavy in the old masters, it really spans the spectrum from this magnificent old unattributed centipede pin to a few present-day works like this reinterpretation of a traditional Knifewing figure by present-day artist Harlan Coonsis. This vintage Albert and Dolly Banteah bolo of a cardinal shows how much more realistic the subjects of Zuni jewelry have become. This Zuni corn plant pin/pendant shows the originality that has been expressed in Zuni jewelry.